These are absolutely adorable. What a fabulous idea. We don't say suckers, though. We say lollipops. I guess it's regional. SEriously you have one of the most fun families.... faBulous. Your girls are too cool. I have a friend who went to the dollar store recently and purchased "barbie" like dolls and with her daughter, made them into zombie dolls. They were fabulous. 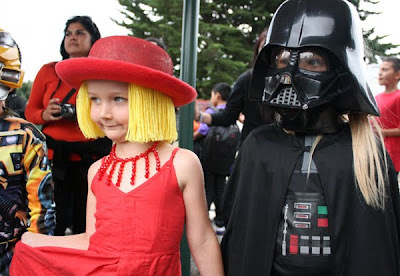 Valentines day is a bit of a non event in New Zealand (well for our family anyway) and its certainly not very commercialised. We say lollipops, but we call ice lollies, ice blocks. (And you might consider a NZer saying 'eggs' to be really hilarious). Incredible! 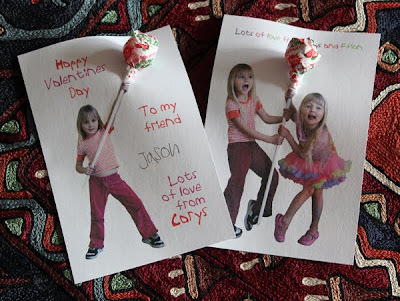 I already did our valentine's because my kid's class celebrated last Thursday, but these are spectacular. 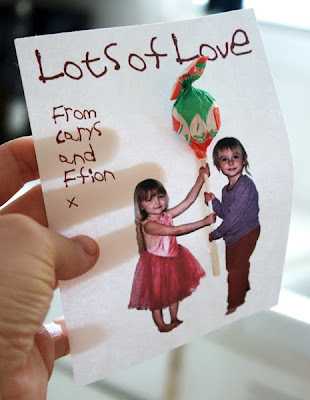 I usually like to include pictures with all the cards my girls send out because what little kid doesn't love pictures? I may be using this technique through out the year. Thank you! Oh my! 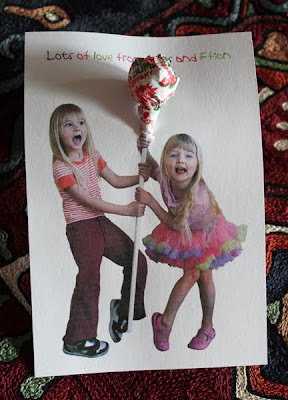 I adore this card with these maxi lollypop!!! Incredible. Something about yours is just so much better than all the others I've seen... Probably your girls' adorable poses! We say lollipops too, both in the SE where I'm from and the NE where I live now. Suckers are west coast, maybe? We normally say popsicles but my daughter picked up "ice lollies" from watching Peppa Pig and we go along with it. oh those cards are amazing!! Valentines in australia is very similar to england I think. I have never seen children give or receive anything. After reading so many cute american valentines things about 3 years ago I decided to bake heart cookies for my girls to take to school... well did the parents look at me like I was crazy and WHY WOULD I DO SUCH A THING?? I am a Brit living abroad too so often come across the odd differences in language, an Aussie frind said she was bring a bag of lolly's to the park with her and when she got there it was a bag of sweeties, non of them on a stick! My Northern California family also calls them lollipops. That photo of the two girls is just hilarious. I've got to remember this project for next year. This year my two year old is making cards for all her friends, but we're not passing out any candy. Here in New Zealand Valentine's Day isn't big at all...and if you do participate it's cards/gifts between adults...not kids. We call ice lollies popsicles or iceblocks and call lollipops lollipops. A sucker here is someone who is gullible! I just stopped by to look for something to do with my kids on Valentine's Day, so thanks for gathering all your (ever fabulous) ideas in one place. Here in Japan, generally on Valentine's Day women give chocolate to men, and then one month later on "White Day", men reciprocate. It's not a big day of romance - that's reserved for Christmas Eve! We dont really celebrate here, but thats just our family.We did some crafts this year and Nana brough Valentines cakes and things.I think we might make more effort next year but with our wedding anniversary the week before it gets a bit much! East Coast US (Philadeplphia, Washington, DC)...Lollipops all the way. Great valentine concept. I'm kicking myself for not thinking of it myself!!! Most of the other commenters have explained all about Australia. The only thing I can add is that we say Icy Poles for... hang on, I can't remember what you called them...anyway, the ice creams on sticks. Valentines Day round my house has a pretty high cringe factor. I've been quite surprised by all the American fervour. Oh my, those are wonderful! We'll definitely be making those next year. We say Lolly or Lutscher. In Germany only Lovers and Couples give Gifts ore Flowers each other. Thats to bade, your cards are so great! Everyone in Ohio (where I grew up) said "Suckers". I hated that, and have aways said "lollipops". Ohio also uses "pop" for soda. Hated that too... :) happy Valentine's Day! I'm from Texas and I say "lollipop." And I love the holiday. My kids aren't even school age yet but we make and give Valentines to our friends and family every year. That's so cute and clever. I was struck by how much your beautiful girls changed and grew in just a year. These are super! I think we'll have to try some next year. These are so insanely funny. And I love your girls' personalities. 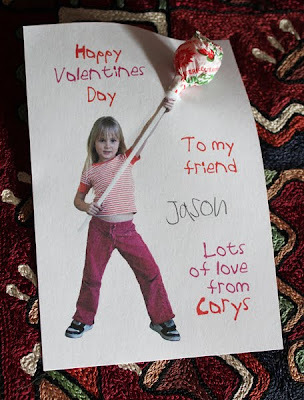 What a cool idea for a VD card! Love them. All I did was just have M paint a giant heart and decorate it and then I photographed it and made multiples in Photoshop. We did make heart magnets for each card. In Texas we celebrate it similarly to the way they do in the U.S. I just stumbled across your blog and then ended up spending the past hour scrolling through the posts. Fantastic ideas! I love it! What a cool idea! I love it!! We did this for shaloch manos Purim cards (on the Jewish holiday of Purim you give friends and neighbors edible goodies). Pictures are here: http://druyan.blogspot.com/2011/05/purim-cards.html. Thanks as always for inspiration!